To everyone who was traveling alongside me yesterday, this is for you. Like some of you out there, I spent Valentine's Day in the airport. Alone. I had intended to photograph this and put it up before I left for New York as a sort of gift, but I ended up getting caught up in packing and whatnot. My plane arrived at the Charleston airport at 11:56 last night, so the light was not exactly ideal or conducive to taking pictures. Instead, I set up my tripod and got to work this morning when the light was filtering wonderfully through the windows in my dining room. Anyway, I didn't think any of you would mind a belated Valentine's Day gift from me. The weekend I spent in New York was as fun and as fruitful as any that I can remember. The Roger Smith Food Writers Conference was very informative and provided me with many new contacts in the food world, whether in magazines or in the blogosphere. However, my favorite part of the weekend was my visit to Dorie Greenspan's Cookie Bar. She could not have been any sweeter, and her cookies were phenomenal. It was such a pleasure to meet one of my idols and to find out that she was even better than I had imagined. 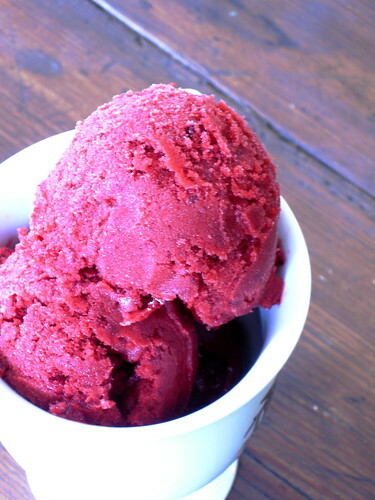 This sorbet would be the perfect antidote to one too many chocolate truffles or even to a fit of loneliness. If you ask me, it may even be more delicious for not being served on Valentine's Day. There is no bitterness left by a wounded heart and no all-consuming love to distract you from the passion and joy that the sorbet itself brings. I had planned to share this dessert with my friends, but I don't think it will survive the night at my house. We may just eat it all. Puree the blackberries in a food processor and force the puree through a sieve to remove the seeds. Heat the sugar and water until the sugar dissolves. 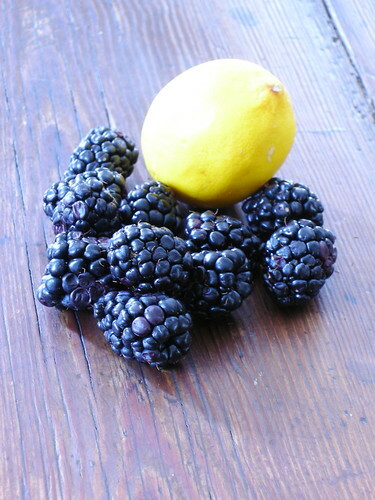 Stir into blackberry puree. Stir in the lemon juice and kirsch. Freeze in an ice cream maker according to manufacturer's instructions. I had to fix a very bad grammar mistake in my previous post. 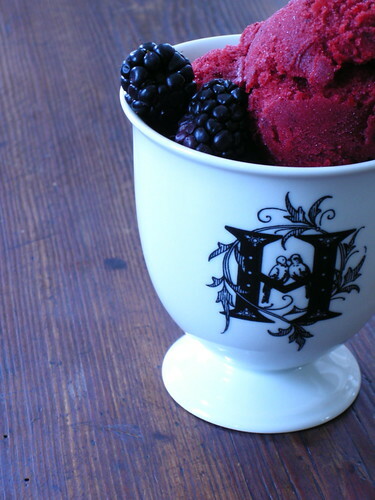 I should have said: This sorbet looks delicious. If any SURVIVES the night, you should being it to school tomorrow! I would love to taste it! Phew, now I can sleep in peace without thinking about my lack of grammar skills.